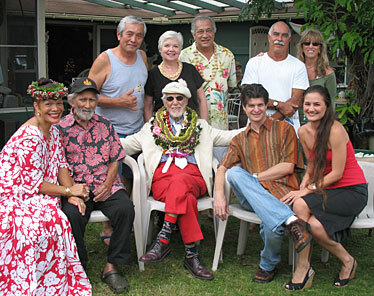 TAPIA CELEBRATES HIS CENTENNIAL: Bill Tapia, seated, center, celebrated his 100th birthday Sunday at a backyard luau hosted by Mihana Souza, seated left, in Kailua. Tapia was born on Jan. 1, 1908, but since the UH Warriors are playing on New Year's Day, he decided to celebrate two days early. 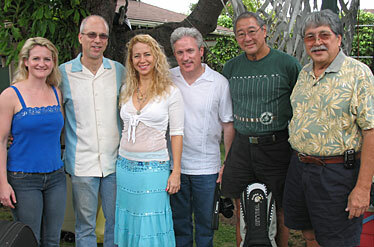 Joining him were David "Uncle DD" Baptiste, seated second from left, Jeff and Mahea Peterson, and, back row left, Yoshi Ishikawa, Nancy and Pat Enos, Chuck Souza and Luana Brown. As it turned out, "Tappy" was not the oldest one there -- Baptiste was born on Dec. 14, 1907. Amy Porter, left, visiting from the University of Michigan, chatted with rRed Elephant co-owner Joey Wolpert and his guest, Amber Ricci, Steven Byess, Byron Yasui and Benny Chong. Yasui's father, Shigeo Yasui, recorded Bill Tapia in 1936, and Wolpert has presented him several times at the rRed Elephant. Yasui and Chong welcomed Tapia on stage and jammed with him later in the afternoon. Douglas Po'oloa Tolentino, left, and Pakala Fernandes got the party off to a perfect start with a set of classic Hawaiian songs while Tapia was receiving leis and greetings from well-wishers. Both are related to Mihana Souza through her mother, Irmgard Farden Aluli. 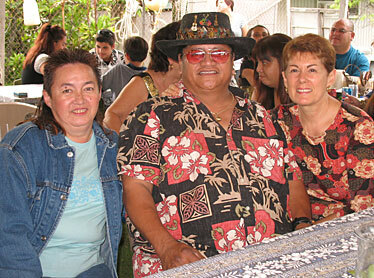 Sharon Kaapana, left, and her husband, slack-key guitar master Ledward Kaapana, enjoyed the music, pupus and hearty Hawaiian food with Judy Barrett at a table under the tent. Led came to the party ready to play, and he added the magic of Hawaiian falsetto and slack key to the impromptu concert. 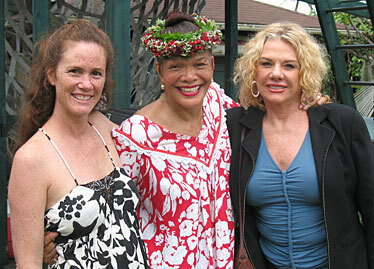 Birthday luau hostess Mihana Souza, center, welcomed Kathy Emerson, left, and Barbara Bryan. Souza introduced Tapia to the guests and then opened the "official" party -- and the food line -- with a solo performance of the Farden family chant of welcome, followed by their family song, "Puamana." 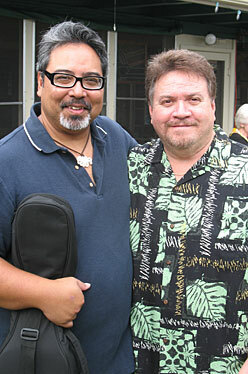 It was the first time in 62 years that Bill Tapia had celebrated his birthday in Hawaii. Happy 100th, Bill!